Continuing with the theme of using up the too large / too small / not quite Goldilocks fabric remnants, I present another New Look crossover top. The fabric was originally made into a Jalie Sweetheart Tee, which I wrote about here. 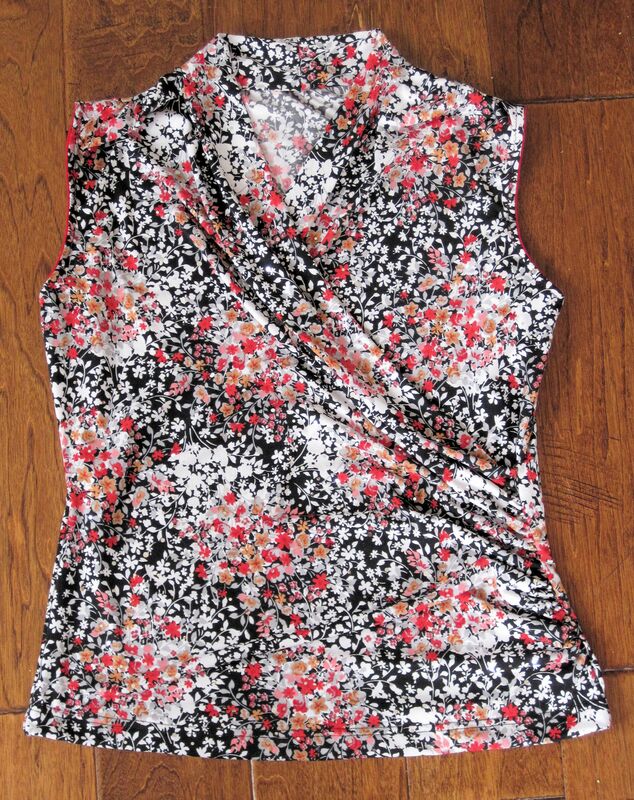 There was enough left to make up a summery tank using the sleeveless version of the New Look pattern. Having mere scraps after cutting out the main sections, I bound the armholes with a solid red knit. It’s not obvious, but gives a little peek every so often. 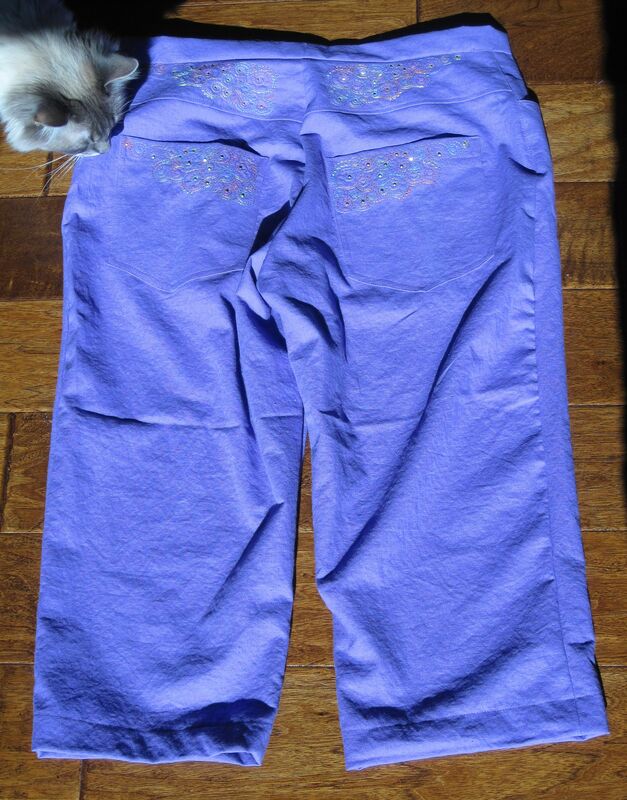 There are holographic sequins on the fabric as well, making for a bit of twinkle. These will probably be the last of the capris I make between now and next summer. I think I have enough pair that (mostly) fit to see me through Fall. If not, well, I shall just have to do some laundry! 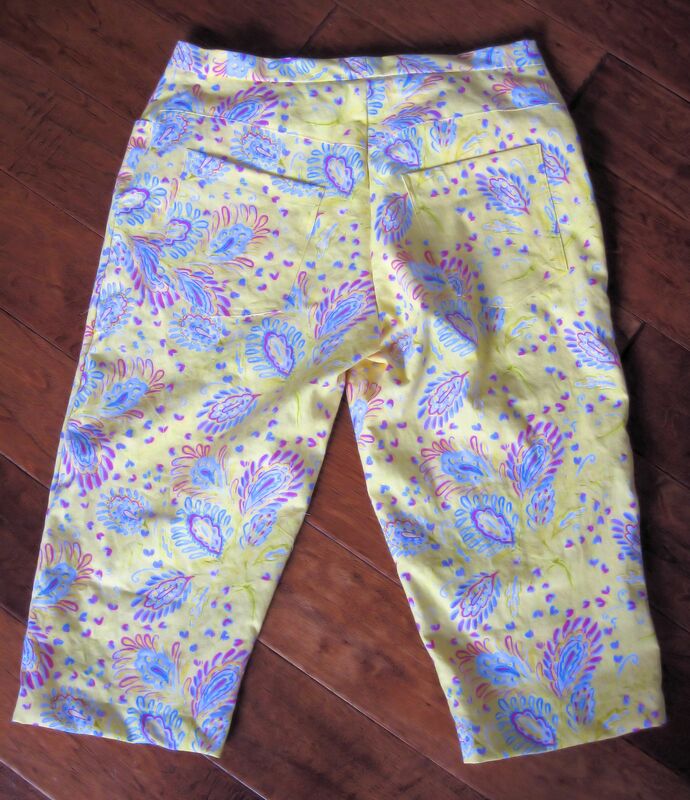 These are a lovely lemon yellow linen with a not-too-bright complementary paisley. I believe the fabric is from Fabric.com One of those items tossed in the cart to reach $35 to get free shipping. The pattern is my standard Jalie 968, now out of print. Pockets in front. Pockets in back. A girl can never have to many pocketses. The only design changes I made were to shorten, then narrow the legs so they don’t look like marsh waders. This fabric is much too pretty for marsh muck. The weather is warming up, and it’s time for wearing something other than jeans. This means capris and shorts. Since we aren’t yet into the really hot months, it was time for some capris. This is my T-N-T Jalie pants pattern (# 968), shortened and taken in to become capris. Yes, that’s my able-pawed assistant there in the corner, giving everything a once-over sniff. There is really nothing unusual about making these. I followed my standard pocket and fly zipper insertion methods. Took the legs in a bit, and of course shortened them to just below knee length. These capris seemed a little plain, so I decided to jazz them up a bit with some pocket and yoke embroidery. That meant searching through the embroidery files for something suitable. Bobbi Bullard, of Bullard Designs had the winner once again. She just has a knack for embroidery designs that work well on clothes. This design set is called “Curlies”. It may no longer be in release, as I couldn’t find it on her web site. One can opt for embellishing with crystals/nailheads or not. I chose nailheads, as crystals seems a bit presumptuous for capris. The diligent reader will recognize these T-shirts as having made a previous appearance in Sewing with Spooks. They were tacked onto the Wall of Completed Projects. Alas, they weren’t 100% completed. They still needed to be hemmed, so had to wait until I got home and had access to the coverstitch machine. I know, I could have used a twin needle, but whenever I do that, the stitching ends up tunneling. What can I say, I’m fussy. They are now finished, and waiting for a little warmer weather to be included in the wardrobe rotation. I think they’ll look nice with capris and shorts. I know they’ll be comfortable. The fabrics are a mix of knits: rayon, ITY and cotton. All are about the same weight. Differences? 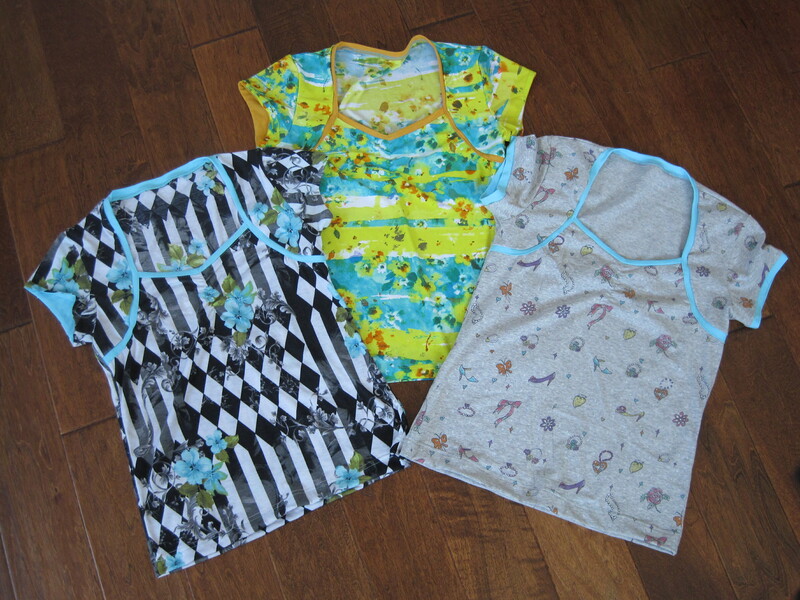 The harlequin and green tops have the sleeves lined with the piping fabric. The grey cotton has a contrasting band added instead. They’re just a little different from the standard Ts from Targét. A nice addition!